Time is of the essence when throwing together a quick bite to eat and with only a few ingredients and a few minutes. The magnificence of purchasing precooked store food is that is takes such a large amount of the hassle out of cooking when you just want something fast. Already cooked, vacuum packed octopus certainly worked just fine here but if of course you have more time on your hands you can simmer fresh octopus that has been prepped by your fishmonger. 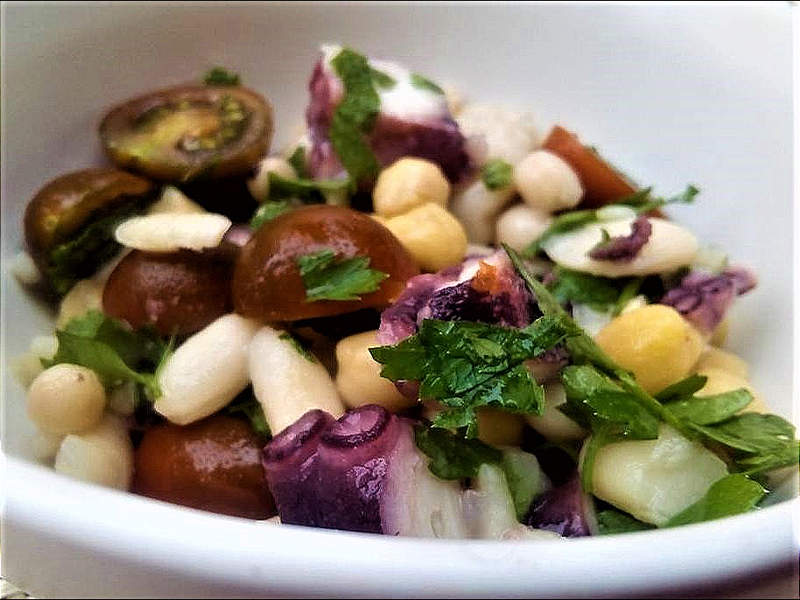 This lunch salad is dressed in lemon and extra virgin olive oil and doesn't need anything more than a couple of halved cherry tomatoes and some cooked chickpeas with chopped parsley for a very straightforward lunch. I must mention though, that I should have checked the larder before preparing this dish. I only had half of the chickpeas that were required but fortunately I had some jarred white beans to make up the difference which added to the already nice colors. Place everything in a large salad bowl and mix with a wooden spoon. Simple.